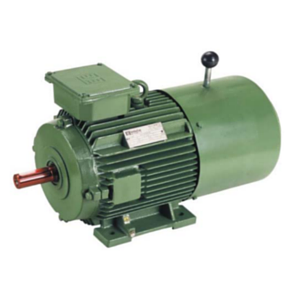 Brake motor is a combination of an A.C. induction motor and an electromagnetic AC or DC brake. The electromagnetic brake is mounted on the non–driving end of the motor. General applications of Brake motors are printing machinery, textile machinery, rolling mills, cranes & hoists, material handling equipments, machine tools etc. The brake motors are simple & rugged & so easy for maintenance. No separate DC supply is required as the rectifier is provided which gives the required DC voltage for energisation of the brake. The rectifier is mounted inside the main terminal box so no separate terminal box required. Brake coil is energized by DC side switching as shown in the diagram. Selection chart is a general guideline for selection of brake size. If braking torque required is other than that mentioned in selection chart, this can be provided on request. Brake motors with safety factor less than 2 are not suitable for crane/hoisting applications. The motor must never be switched “ON” unless brake is energised & the brake should never be de-energised when the motor is “ON”. Brake motors with higher braking torque can also be provided on request.